LAS VEGAS (AP) — O.J. Simpson faces at least four more years in prison after a judge rejected his bid for a new trial in his Las Vegas armed robbery and kidnapping conviction. “All grounds in the petition lack merit and, consequently, are denied,” Clark County District Judge Linda Marie Bell said in her ruling Tuesday. Simpson’s lawyer Patricia Palm said she spoke briefly with the former football star from prison, and said he was disappointed but would appeal to the Nevada Supreme Court. Simpson’s new defense team argued that his original lawyers botched his case. “We’re confident that when we get to the right court we’ll get relief because he deserves relief, because he didn’t get a fair trial,” Palm told The Associated Press. Clark County District Attorney Steve Wolfson, whose wife was the judge who presided over the Simpson 2008 trial, called Bell’s ruling the right decision. “I believe Mr. Simpson received a fair trial and had more than competent counsel,” Wolfson said. 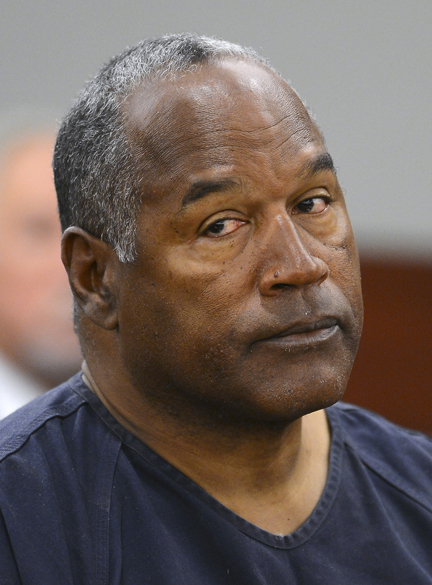 Simpson’s conviction came 13 years to the day after the former movie and TV star was acquitted in the Los Angeles “trial of the century” in the stabbing deaths of his ex-wife, Nicole Brown Simpson, and her friend Ronald Goldman. Six years later, a jury in Miami acquitted him of all charges in a Florida road rage case. Simpson’s legal defense in his Las Vegas trial was headed by Yale Galanter, the Miami-based attorney who represented him in the 2001 road rage case. Attorney Gabriel Grasso served with Galanter as co-counsel in Las Vegas. Galanter, who testified during Simpson’s five-day habeas corpus hearing in May, said he felt vindicated. Bell's 101-page ruling rejected arguments that Simpson received inadequate legal representation. “Mr. Simpson’s convictions stem from serious offenses,” she wrote. The judge noted the involvement of six co-conspirators and weeks of advance planning. “Mr. Simpson specifically asked two of his co-conspirators to bring weapons ... to show the sellers he meant business,” she said. And the two memorabilia dealers were “lured into a small hotel room” where they were surprised by Simpson’s group. Simpson’s new legal team — Palm, Ozzie Fumo and Tom Pitaro — said they believed they presented overwhelming evidence that Galanter knew of Simpson’s plan, had conflicted interests that shaped the way he handled the case, and that Simpson didn’t get a fair trial. They said Galanter failed to hire an investigator or have experts examine crucial evidence, including audio tapes that jurors later said convinced them of Simpson’s guilt. Simpson’s lawyers sought to show that Galanter advised Simpson it was OK to take back his items and should have stepped aside so he could be called as a witness for Simpson’s defense. Finally, Simpson’s legal team said that by handling the appeal, Galanter nearly precluded Simpson from ever arguing he had ineffective counsel. Galanter dramatically contradicted Simpson’s account. He testified he was surprised when Simpson told him that he and several other men were planning a “sting” the next morning.